Can you commit to having your best event ever? Then this is the episode for you. Grab a cup of coffee, allow yourself this time. Enjoy the show! 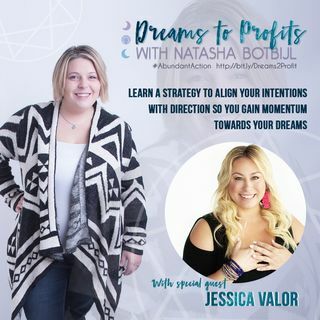 Business Strategist, Master Energy Healer Jessica Valor joins Natasha to chat about how to align your intentions with your direction and true commitments and how this helps to support a great event. •What is holding ... Más informaciones you back from creating that amazing event. Jessica Valor is an inspirational speaker, healer and mentor who delivers her programs to thousands of women and men entrepreneurs every year on the topics of conscious leadership, intuitive intelligence and personal development. Jessica is a clear and powerful conduit for high-level spirits. She awakened to the strengths of her clairvoyant, healing gifts in 2011 after her own "near-death experience" where she visited heaven, met with a council of ascended masters and returned to life to help the world heal and move through ascension. She works with change leaders all over the world offering a transformational and transcendental experience through her speaking, mentoring and energy healing academy.